I’m writing this on my Kindle Fire at Starbucks, so I’ll polish it a bit later. In today’s Best Buy ad, they have what is very close to a “buy a Fire, get a Mindle half off sale “. This deal is good through May 5th. They also have a Kindle Touch 3G (not just wi-fi) for $149.95…and then they give you a $40 gift card. 3G is nice to have: it means you can connect in a lot more places, not just places with a wi-fi network. It also looks like these are good online…and they have free shipping on everything at BestBuy.com (with a couple of small disclaimers) through May 7th. This is valid today, Sunday May 29, through May 5th. If you buy a Fire also, the Best Buy deal is about $10 better. If you don’t, obviously, the Walmart ad is better on the Mindle. Best Buy has a good deal on the 3G Touch, though. Do these two deals suggest something is coming soon from Amazon in terms of new hardware? Maybe, but Mothers’ Day is traditionally a big sales period for books, and that likely means EBRs (E-Book Readers) as well. It’s not only the Kindle Daily Deal, it’s the Gold Box Deal…Gold Box Deals usually aren’t Kindle items. When I went to see which mysteries they were, I first checked for current, popular authors. That’s not what I saw (we’ll probably starting getting more of those in these sorts of deals when the Agency Model suit settles). However, I also wasn’t seeing works by what might be called “nouveau authors”. Those would be authors who have only recently started having their books available for purchase, largely due to e-publishing. These were older authors, although they may not be well-known. I decided to go with “legacy” books…they are our legacy from the paper days, when they were first published. Certainly, in some of these cases, they probably go back to pulp (not necessarily these specific works). I like that term: “legacy books”, so I expect I’ll use it again in the future (although I’ll define it again…I know it bothers some people that I constantly define the terms I use, but I do that to accommodate people ho are encountering them for the first time, or who have forgotten). A legacy book was originally published in paper (pulp, paperback, hardback) prior to 2005 (when e-books began to be really considered, although it was 2007 before the Kindle transformed the market). So, who do we have? Update: thanks to my readers wvstampman and adelaideb for comments which helped improve this post. “Good morning,” said Cap’n Bill, politely. “We’d like to do that,” said Trot, and then she and Cap’n Bill turned away and walked down to the shore, to see if any other land was in sight. “I wonder who you are,” she said. “Oh. What do you observe?” asked the little girl. “Everything I see,” was the reply, in a more surly tone. Then Pessim drew back with a startled exclamation and looked at some footprints in the sand. “Why, good gracious me!” he cried in distress. “What’s the matter now?” asked Cap’n Bill. “Someone has pushed the earth in! Don’t you see it? “It isn’t pushed in far enough to hurt anything,” said Trot, examining the footprints. “I s’pose so,” admitted the little girl. “Well, here it is pushed in a full inch! That’s a twelfth of a foot, or a little more than a millionth part of a mile. Therefore it is one-millionth part of a calamity—Oh, dear! How dreadful!” said Pessim in a wailing voice. “Raining! Is it really raining?” asked Pessim, beginning to weep. “I won’t be after I get to the shed,” replied the sailor-man. “Then do me a favor, please,” begged Pessim, walking briskly along behind them, for they were hastening to the shed. “Depends on what it is,” said Cap’n Bill. “I wish you would take my umbrella down to the shore and hold it over the poor fishes till it stops raining. I’m afraid they’ll get wet,” said Pessim. Trot laughed, but Cap’n Bill thought the little man was poking fun at him and so he scowled upon Pessim in a way that showed he was angry. The Scarecrow of Oz by L. Frank Baum was originally published in the USA in 1915, and is in the public domain in that country. This post by Bufo Calvin originally appeared in the I Love My Kindle blog. 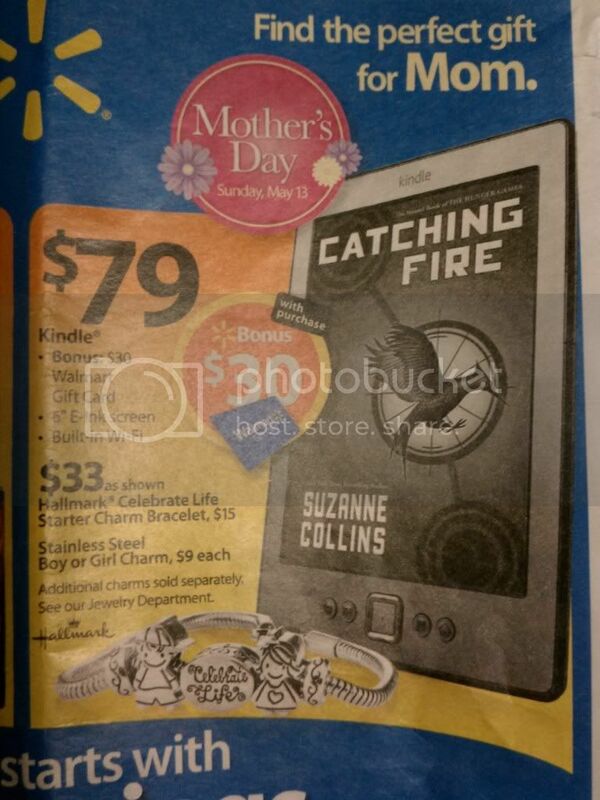 Walmart offering Kindle deal for Mothers’ Day? I was sort of holding off on this, hoping to get a confirmation before I ran it, but it looks like it might not be known for sure until Sunday…and some of you just might be shopping for Kindles this weekend for Mothers’ Day (or other reasons). It’s supposed to be a “leaked” ad for Walmart, presumably for their this weekend. It shows that if you buy a Mindle for $79 during the sale period, they’ll give you a $30 Walmart gift card. The question came up about Amazon price-matching. Second, the price of the Mindle would still be $79…that would be the price match, not $49. Still, that’s an attractive deal. You could use the $30 for accessories, like a cover or a light. I’ll keep checking the for the ad, and update this if I see it. Okay, some of you know this about me…I really don’t like spoilers. My favorite thing in entertainment is to be surprised, and taking that away from somebody is…let’s go with inappropriate. When a newspaper spoiled a big Star Wars secret, above the fold (so it showed in newspaper stands), I never bought that newspaper again. Well, I’m glad I hadn’t seen this before I got my first Kindle! I’m going to do something atypical here, and not recommend that you read the article…because ironically, the article about the spoiling reproduces the spoiling…and even comments on it! Without giving away the details, the basic story is that there was a big ad on a public transit vehicle for the Kindle…and it showed the opening paragraphs of Mockingjay, the third book in Suzanne Collins’ The Hunger Games series. It would be different if it was the first paragraphs of the first book…that just gets you started, it doesn’t tell you about events before you would discover them in the course of the series. I know, it was some advertising agency’s decision, and I’m not holding Amaozn responsible…but if that was my first contact with the company, it might have been different. Rich Jaroslovsky writes about two devices: the NOOK Simple Touch with GlowLight (TM) and the Galaxy Tab 2. As to the GlowLight (TM), yes, Barnes & Noble stole a march on Amazon…again. It has happened before…the NOOKColor beat the Fire handily to market, but the Fire was, I would say, considerably superior. I’m expecting Amazon to come out with a glow light (not TM) 😉 reflective screen Kindle this year…at least one. You know, it amuses me when some people paint Amazon as this greedy corporate monster, just piling up huge profits at the expense of society. Let’s leave the “expense of society” out of it for now, because that’s pretty hard to judge and somewhat subjective. Amazon says that net income for the first quarter of 2012 was down a whopping thirty-five percent from the first quarter of 2011. This certainly isn’t a surprise: they’ve been spending like crazy in that past year. They launched a very different hardware product in the Kindle Fire. They’ve been signing deals for videos for Prime. They’ve been paying millions of dollars to publishers when customers borrow their books. Sales are way up: thirty-four percent comparing the first quarter of 2012 to the first quarter of 2011. It always seems a bit weird to me how the stock market reacts.It isn’t how you did: it’s how you did compared to how they thought you would do. Amazon stock is going up on this news, because people thought their income loss would be more than it was and/or that their sales would be lower. Amazon is a long term investment. They are building the future, and that might be at the expense of the present. Let’s be honest: Apple made a lot of profit in Q1. If you have a short-term view, if you are looking at current state, Apple is doing better. However, if you are looking at where things may be ten years from now, that might be different. Will Apple continue to transform the businesses in which it is the leader? Sure, that’s possible. Will Amazon do that? I’d bet on it. Yes, I might lose big…but I would think that Amazon will be the top of the heap or buried at the bottom, not in the middle. They will have been right or they will have been wrong…but they won’t have been asleep. about the Q&A section of the conference call. That’s often the most interesting part, although usually, not much concrete comes out of it. Nothing big slipped out of the call and into the news. This one is fascinating news! that all of its e-books (both in the USA and the UK) will be DRM (Digital Rights Management) free by July of 2012. It’s a bold move by a major publisher (Tor is part of Macmillan) and this will be watched closely by the industry. Let’s start out with what it means. DRM is typically accomplished by inserting code into a book file (in this case) to control its use. For example, DRM might prevent someone from copying a file, or converting it to another format, or accessing it through text-to-speech. Many people on the internet have expressed distaste (and that’s putting it mildly) for the concept. Releasing a book DRM free means that purchasers can buy it from the Kindle store and convert it for use on a NOOK. It doesn’t mean that you can do whatever you want with the file. You are still bound by laws and your license agreement. Here is what I think people may not see as the unintended consequence of this: more legal prosecution of pirates (even unintentional ones). That’s what I have liked about DRM (although there are things I don’t like). It’s a preventative measure, not a punitive one. It doesn’t stop serious pirates, we know that. If there is no electronic prohibition, your grandparent opens it. The publisher could, hypothetically, go after you for that violation…and that might not be pretty. Those are the choices: prevention or prosecution, basically. Amazon gives publishers using their Kindle Direct Publishing the choice to include DRM or not. I don’t know what the statistics are as to how many do. It’s odd to me that it doesn’t say it explicitly on the product page…I’d like to see a lot more things on the product page, but that’s a different issue. So, are you likely to care about what Tor books does? They do mostly science fiction and fantasy…and well known ones, at that. There is a major movie being made of Orson Scott Card’s Ender’s Game, for release November 1st of next year. That’s a Tor book…and a widely-read one. I’d be willing to say it is some young people’s favorite book. Oh, and they do say that the books “…will be available from the same range of retailers that currently sell their e-books”. That certainly suggests you’ll still be able to get them at Amazon. There is some interesting back story on this, since I think Macmillan formerly cracked down on Tor releasing some books without DRM. Does this signal a shift? If it works for Macmillan, will other big publishers follow? What do you think? Will these books get a sales boost? Will there be a crackdown on infringement? Is this the beginning of open e-books being the norm? Feel free to let me and my readers know by commenting on this post. Amazon announces that Send to Kindle has come to the Mac. That’s significant in a couple of ways. Not only does it show that Amazon is continuing to work to give us more capabilities (at no additional cost), it also shows that they take the time to notify us…in a customer forum. I often go back to that as a reason why I like Amazon…customer service. I was recently made a “Kindle Forum Pro”, which gives me a badge in the forum. It’s based on forum member ratings, and I think they said they reassess it every quarter. I don’t like the name of the title, actually, because a “pro” to me suggests that I’m getting paid for it. I’ve also seen the sincerity of one of the Kindle Forum Pros called into question by other posters…the suggestion was actually made that the “pro” got the badge by toeing the company line! I’m surprised at how eager people are to put negative interpretations on things. We’ve had Send to Kindle for the PC since January 13 of this year, and it is a nice feature. Everybody knows you can’t watch movies on an RSK (Reflective Screen Kindle), right? Well, you certainly can’t watch full video, like you would see on Netflix (which just had a worrying financial report, by the way…could Amazon Instant Video be having an impact?) or Hulu. which shows a Kindle Touch doing animation…sort of. It’s more like a flipbook…there are a few images showing an action taking place, and your mind feels in the gaps. Of course, that’s what happens with all video…but how smooth it is has to do with how many “frames” a second you see. That’s the current limitation with E Ink and animation…it just takes too long to “draw each screen” to get a very fast FPS (frames per second) rate. So, you see the gaps. The dark flashes we periodically get would also make this less effective. This is something I expect to have come to a future RSK as well…it’s front-lighting you can turn on and off. B&N is ahead of Amazon on it, and is pushing it for Mother’s Day (which is traditionally a big bookselling holiday). It’s a nicely-written press release, and does say that there are demo models in the stores. They also said there has been “very strong pre-order demand”, which is good to hear, even if a bit imprecise (no less so than Amazon often is, of course). I’d recommend that you do it, but it’s up to you. I added a new section on the keyboard which I think is helpful, and it’s been updated for 6.3. I suspected the update was coming when the “bookstream” (live chat) disappeared on my Kindle Fire for this title in the last day or two. I tried opening the book on my Fire, and it didn’t instantly update (although the MYK page said it had been sent). and then when I opened it, it had updated. This ability to get updated titles (and as an author/publisher, to make them available) is really remarkable. Oh, that sneaky Manage Your Kindle page! Ironically, at this point, I don’t use a GPS (that one eventually failed)…I use my phone instead. If you do try this out, I’d appreciate an assessment…and I’m sure my readers would as well. One of the things people worry about with e-books is a single company controlling access to a well-known book. Unlike some other concerns that get expressed, this is indisputably true. Now, no question, some of those books go through Amazon’s Kindle Direct Publishing (mine do), and may be exclusive because they are part of the KDP Select program (which is how books by independent publishers get into the Kindle Owner’s Lending Library…KOLL…from which eligible Prime members can borrow up to a book month at no added cost). I used the phrase above “well-known”, though. I started looking at this, and I was surprised at how many of them I actually have in paper. If I expand that to “well-known authors”, it gets even more interesting. Let’s say you are a Stephen King fan. You can not have a complete collection unless you buy from Amazon. That doesn’t mean you need to buy a Kindle…you could have a free Kindle app and still own the book. I’m sure there are people who don’t like the idea of this. Of course, it’s commonly been true that you couldn’t own a particular work unless you were willing to buy from a given publisher. If you didn’t like Random House, or Penguin, or Simon & Schuster, you might not be able to have a complete collection of one of your favorite authors, either. I don’t think people are as aware of the publishers as they are of the stores. While Barnes & Noble has had exclusives in the stores, they usually aren’t the frontlist sort of things. Is it really that different that Amazon has exclusives for e-books? Well, let’s take a look at some of the ones that caught my eye…that might help you decide. This book was a number one bestseller and spent months on the New York Times list. I have it in paper, read it, and thought it was really interesting. The basic idea has to do with trusting your instincts in detecting people who may be dangerous. That may sound like it encourages prejudice, but it isn’t that. De Becker is a security expert for celebrities, businesses, and governments agencies. One of the things I remember is the author saying that people commonly feel someone is a threat before they are attacked. It’s that we tend to want to ignore it. De Becker suggests that if you feel like you should cross the street to avoid somebody, do it. Yes, it may be embarrassing, and yes, you could be wrong…but that might be better than being right and not avoiding the situation. This is a book of practical advice from someone who deals with these actual situations. Hoffman is the author of Practical Magic, which became a movie with Nicole Kidman and Sandra Bullock. Hoffman has continued to write popular books. A nonfiction classic, I remember how popular this was when I managed a brick-and-mortar store. Sacks is a psychologist and neurologist, and these are case studies, written in a style for a layperson. King undoubtedly helped launch the Kindle with another exclusive (a shorter work featuring a Kindle called UR), but later approved of “windowing” a book (releasing the e-book considerably after the paperbook) and has had text-to-speech access blocked on some books. That’s right…if you want to read this classic as an e-book, you have to get it from Amazon. Erdrich is a beloved American writer, a finalist for Pulitzer, and a National Book Critics Circle Award winner. This book was popular in my bookstore. Anthony may be best known for the pun-filled, whimsical Xanth series, but this is another popular one (and it’s not just this first book in the series that is exclusive to Amazon as an e-book). Cookson is one of the most popular writers ever…period. So, what do you think? Is it bad for society that Amazon has the exclusive e-book deals for these books? Is that just a matter of good business? Amazon presumably pays more to get an exclusive deal on proven book…is that where they should be putting their resources? Feel free to let me and my readers know what you think by commenting on this post. I haven’t looked at this in a while, so it was interesting to see. One of the big selling points of the Kindle Fire was how good magazines were going to look on it. Well, the bestsellers are affected by Kindle Fire editions…but the RSK (Reflective Screen Kindle) editions are still strongly represented. Do you read magazines on your phone? It seems like it would be small, but I’d be interested to hear about it if you do. We subscribe to National Geographic…and it does look beautiful on the Fire. My Significant Other waits for the next issue to read at the gym. I read those, and a couple of other magazines…but not ones for which we pay through the Kindle store. I get one through Zinio, and the other is a freebie I get for subscribing to the paper edition. When you subscribe to these, you get a fourteen day free trial (which is generally going to be one magazine). You pay for them by the month (not an annual subscription), and you can typically buy a single issue. The single issue may cost you more than a month’s subscription will, though. You can share magazine subscriptions with other compatible devices on your account. We read NatGeo on two Kindle Fires, but only pay one subscription price, for example. RD is famous for having short little pieces, like jokes and true stories, often contributed by readers. For us, this is well worth $1.99 a month. On the Fire, the pictures are stunning (and you can pinch and spread them…I’ve done that to show the Fire’s capabilities). The articles are often in-depth on very narrow exotic topics, and I do find that fascinating. You can pay to subscribe, or you get it free with the paper edition (P+D…Paper Plus Digital). It’s a health and exercise magazine marketed for women…they note that not all images from the paper edition may appear in the Kindle edition. This one is just focused on celebrities and “entertainment gossip”. Interesting! When I went from the first five to the full list, I had a different order…and it included the app versions. What I did was list the most popular ones I hadn’t listed yet that were not apps. That’s not to say that the app version isn’t is good, but it’s definitely a different thing. More celebrities…”they’re just like us!” So, if you want a picture of Bradley Cooper stopping to tie a loose shoelace, or Jennifer Aniston putting a cup of coffee on the roof of the car to open the door, this is the magazine for you! Well, that’s the top ten! There are a lot of other choices, and as I mentioned, you can get them other places, too. I really like it when a magazines offers both “page view” and “text view”. The former is a replica of the print edition…ads and all. The latter includes pictures in the article, but otherwise, seems a lot easier to read. When I was compiling the list, I noticed that some indicated that…good to know ahead of time, even with a free trial. The other thing I’ve seen confuse people is that the magazine will continue to be paid by the credit card you used when you bought it, even if you change your 1-click method. You change that in that MYK page, then Kindle Payment Settings.